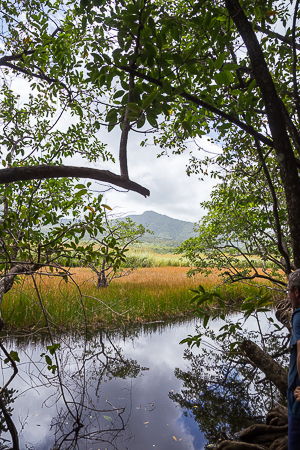 Lessons learned from a long odyssey to find Camera Repairs and Replacements in the Caribbean. We are all familiar with the “blue screen of death” on our computers or have heard tales of those who have (MACs have the bomb icon, I think). But, to encounter this on your camera is unexpected and unwelcome. I was on a trail hike with some friends on the east coast of Martinique when it happened to me. Taking a picture, my camera made a strange noise and gave me a error message on the back screen. The camera refused to take another picture. It turned instantly from a camera to a brick. I returned to the boat and researched the cause of the error message. It indicated a mechanical problem with the shutter. After trying as many things as I could think of, with not avail, I gave up. 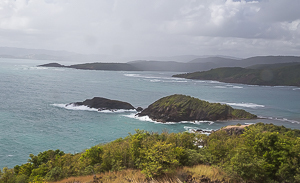 The East Coast of Martinique. One of the last pictures taken by the camera. No John you did not break it. I carried cameras to all corners of the world, as part of my job. I always worried about theft, loss or damage. I discovered early on that insurance on a camera is inexpensive and covers most threats. It typically costs one or at most a few percent of the value of the camera per/year. I considered it a very good deal. In all those years, I did not have to use it. When I got my Digital Single Lens Reflex (DSLR) a few years ago, I decided to insure it as well. So, my first call was to my insurance company. Yes, they would cover the problem. What is more they would cover the expense of shipment back to the US to have the camera serviced. The only thing that would not be covered was normal wear and tear. I had taken a lot of pictures, but nowhere near the 100,000 shutter rating. I went on to the internet. I could not find a repair facility for my Canon camera in the Caribbean. Actually, I could find none for any brand of camera. The nearest was in the United States. I called them about sending it in for service. There I encountered the first problem. They would not accept shipments from overseas. I would have to ship it to someplace in the US and then on to Canon (they would also not ship it back overseas either). While I never checked any other brands, I strongly suspect it is true of all brands. I filled out the repair order on line and then turned my attention to the logistics of getting it to them. Not everything works as planned. 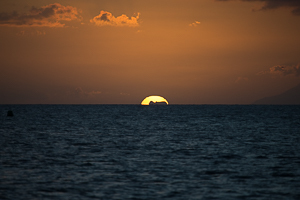 Trying to take a green flash picture. The only rock for miles around gets in the way. I was in the anchorage off Saint Ann’s, Martinique. I looked into shipping it from there. The post office would ship it, I was advised. But, I was more comfortable with using FedEx. Unfortunately, FedEx was located some distance away and getting there would be an issue. After taxing my limited French to get a box (the post office) and bubble wrap (a party store in La Marine), I decided to take my boat to Rodney Bay, Saint Lucia, twenty five miles away. I had used the FedEx store there before and I could speak the language (sort of as it is “British” English). Taking my boxed camera in hand it took a cab to the FedEx store. Lesson 1 – don’t seal the box they will need to inspect it. Lesson 2 – due to the paperwork and time to complete it, take the bus. My cab driver was well pissed by the time I got done an hour later. FedEx turned out to be very helpful. However it took me nearly one hour to complete the paperwork and get the shipment out. Besides the FedEx air bill, you need to fill out a US customs form. Not a problem. Be sure to indicate the camera is going in for repair. You also need a FCC form as many cameras transmit a signal (WIFI or other). You also need a very important form, a Saint Lucia customs form. This form allows the camera to return to Saint Lucia without duty (except on the cost of the repairs). I also needed the camera inspected by a customs officer to verify the serial number and model. As I said, it took an hour. But in the end it was off to the US. I use Saint Brendon’s Isle. So that was its first stop. They were very helpful and turned the camera around in a few hours. It arrived at Canon the following day. 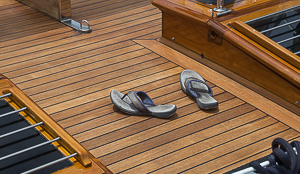 Saw these on the pristine deck of a mega-yacht. Not sure what happened to the owner. But there is a mystery here somewhere. My first conservation with Canon was positive. They told me that my camera would be inspected and repaired in 5 business days. They also told me I would have to pay a fee to have the camera inspected which would be credited toward service if needed (my camera was well out of warenty). My insurance company agreed that this was a justified expense. So I deposited the fee to Canon. At this point, my insurance company reimbursed my shipping to the US and the cost of the inspection by Canon. Problem 1 – Not all you hear is true and not everything you think you hear is what is said. Canon has a very nice tracking page on their website. I discovered it would not work if the origin was out of the US. After waiting several days for an email indicating they had received my camera, I called them. I discovered that it would take 5 to 7 business days for the Camera to get into the system. This is before it is even looked at. Once it is looked at it might take another two weeks to get fixed. Canon repair is a major concern and repairs everything from FAX machines to high end cameras. Lesson 3 – ask more intelligent questions. Lesson 4 – Canon and most other camera manufactures offer a professional program. I was eligible to join. The program offers a much quicker turn around with only a few dollars per year and gives many other benefits. As a follow up on my phone call, Canon sent me an email asking if I was satisfied with the call. No would be the short answer. The long answer likely burned a few ears. I am not sure if it had anything to do with the events, but the next day my camera was in the system. Three days later, I got an email with their evaluation. My initial reaction to the email was joy, my camera was fixed. Then I read the email more carefully. Yes they were shipping it back to me, but they considered it beyond “economic repair”. Toast! After a few choice words, I called the insurance company. Yes they would cover it, but it would depend on what exactly was written on the evaluation. After waiting a few days, I called Canon. Sorry they said, but they had shipped the camera and the evaluation was with the camera. She looked up the repair order and told me that they had found major corrosion inside. Could she send me a copy of the evaluation? No! After, talking to several people, I finally got them to admit they could send me a copy of the evaluation, but it would take several days. Not good, as the insurance company needed that piece of paper to proceed. The new camera arrives. Along with some extra stuff. Canon did direct me to their loyalty replacement department. They were willing to sell me a new or rebuilt camera at a reduced price. They would also offer me an upgrade (either new or rebuilt) at a good price as well. Finally the camera arrived back at Saint Brendon’s Isle. I had them open the box and email the evaluation. I then emailed it to my insurance company. No problem they said. We will replace the camera with a like, new camera with no deduction. But, they needed a written cost estimate. I went back to Canon. They told me the cost break down on a like camera. But, it would take several business days to send me an email containing this information. Where have I heard this before? In frustration, I called B and H Photography in NY. Spoke to a guy there and before I hung up the phone I had an invoice with a firm estimate. I sent this information to my insurance company along with my verbal estimate from the Canon “Loyalty” program. The next morning I had a check for the full amount of the Loyalty program estimate, plus shipping, plus tax in my checking account. I ordered the camera from B&H. They shipped it out that day. End of the Story? NO! Wait, there is more. It turned out that B&H could not ship to me in Saint Lucia without my paying NY sales tax and very expensive FedEx shipping cost. But, they would ship to Saint Brendon’s Isle without collecting sales tax. Here is where things started to go as the British say “Pear Shaped”. Problem 1 – While FedEx cost was 50 dollars from Saint Lucia to Florida, the FedEx from Florida to Saint Lucia was 200 dollars. I can only assume that the cost in one direction was subsidizing the cost in the other direction. However, a friend had used a shipping company in Miami. Problem 2 – I was now getting back a different camera. So the customs in Saint Lucia would be charging me duty on the entire cost of the new camera. The legwork to get something through customs and the need for an agent caused me to reject getting the camera sent to Saint Lucia. But wait – Saint Martin is duty free. So I up anchored and headed to Saint Martin. 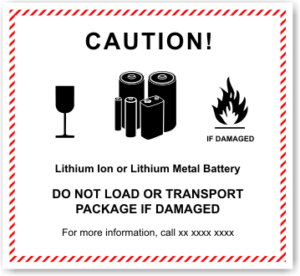 Lithium Ion Battery Warning Label. Ship by cargo aircraft (FedEx), but even then it might require some sort of marking on the package. Ship by passenger aircraft. To ship this way (I assume that four star uses air cargo in the hold of regularly scheduled passenger flights to Saint Martin). The package required some sort of marking that it contained Lithium Ion batteries. What markings no one could tell me. So I called B&H. I was told they had no idea what I was talking about. When pressed they did admit that they did have to mark the packages shipped by air. But they got the information from Canon. B&H could not to give me a copy. So I called Canon. They had no idea what I was talking about either. I suspect I had not reached the right person. The daunting task of finding that right person over the phone from the Caribbean did me in. So I gave up and chose option A. Some years ago a good friend of mine taught at a medical school in Montserrat (before the volcano erupted). They had a shipment of cadavers come in by sea freight from the US; unfortunately there was a dock strike when they arrived. So the freighter continued to cruise the Caribbean with a dozen dead cruise passengers. I pictured this as I committed my camera to the sea voyage. On further research, I found that you can carry on a camera with a Lithium Ion battery (which is good as most cameras have them) and a small amount of spare batteries. You cannot put them in your checked baggage. You can ship by passenger aircraft a device with a Lithium Ion battery as long as the battery is below a certain size (most camera batteries are), BUT you need to mark the package with a special sticker (where you get one I don’t know. You also need to paste on the outside of the package a pamphlet with the instructions of what to do if the battery catches fire. I can only imagine firemen tearing the pamphlet off the box while it is burning and reading the contents. There is no lower limit on the battery size. One tiny hearing aid battery requires this marking. Stupid!! But this is the international law for carrying LI Batteries. A happy Ending? 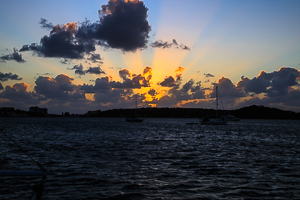 Sunset at Jolly Harbor. One of the first pictures with the new camera. 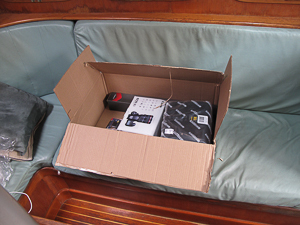 After a week of nail biting and worrying that something would go wrong, the camera arrived safely in Saint Martin. A wild, wet ride in the dingy into 25 knot winds to pick up the package from the air cargo terminal (Four Star Cargo was kind enough to forward it to air cargo terminal so I could pick it up easily). I had an equally wet, wild ride back to the boat. Madly opened the package and tried the camera. All worked. I was very relieved. It took 8 weeks from the time the camera quit to having the replacement in my hands. 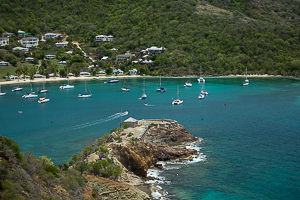 English Harbor, Antigua. One of the last pictures I took before the camera went Pear Shaped. 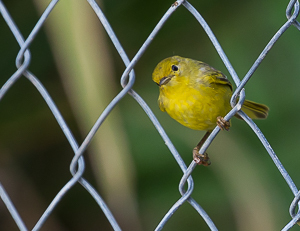 Not long after receiving my new camera, I needed to head back to Antigua to meet a guest who was arriving there. It is usually a long wet slog to windward from Saint Martin to Antigua, but we happened on a day where the wind was light so it was more of a motor sail. I anchored in Jolly harbor and spent the next few days settling in. I did take a few pictures with the new camera and all seemed well. My friend arrived and with her a second camera body. I realized that if I was to be serious about photography in remote places (the Eastern Caribbean) I needed to have a spare body in case things went “pear shaped”. The new camera body was a used, but a much better camera, acquired from a friend, a Canon 1DX. Over the next week or so I spent time becoming acquainted with the 1DX and reacquainted with the 6D. We moved around to Falmouth Harbor and the Classic Yacht Regatta. I volunteered to take some pictures for the Regatta. Used both cameras and took several thousand pictures. One day we decided to hike across the hills to view the returning boats. After a long hot walk and many pictures we returned to the restaurant to get something cool to drink. I placed my camera on the table (the new 6D that I got from B&H) and then picked it up to take some pictures. It was off and there was no sign of life. No error messages, just dead. Tried all the things I could think of but, no life. So my camera, that was less than two months old, was dead. Portsmouth, Dominica. Out on a hike again with the repaired camera. Keeping my fingers crossed. I contacted the store that sold me the camera. If the camera was less than a month old, I could return it, but since it took almost a month to reach me (and the clock was ticking when the camera left the store) they could do nothing. I needed to send it back to Canon for repair. Fortunately, my friend was returning to the US and could lug the dead camera back. Also, fortunately I had a spare camera body so I was not out of luck in taking pictures. This time things went as advertised. My friend carried the camera back and mailed it to canon. Canon examined it within a few days and determined that a “power board had failed” and replaced the board. I did have to produce the sales receipt to prove when I bought it. They did not charge me and mailed it free to my mailbox. The mailbox mailed it to the shipper. Since the camera was the only thing in the box and not any batteries, it went easily by air. A sailed back to Saint Martin and was on hand to receive it when it arrived. It arrived in good condition and I determined it was the same camera that I sent in. After a bit of shake down to determine if it was working, all was well again. And a few days later left Saint Martin heading south once more. From the time the camera first failed in early January to the time I got the repaired one back was four months. So what did you do all winter? Insurance – At the end of the day my insurance paid 100% of the cost of a new camera plus all shipping expenses. I was out the cost of a number of phone calls. I have several friends who have lost cameras to theft or to water damage. Insurance is cheap. Also be sure you mention where you are and where the damage occurred. While I told them this, they did not understand and assumed I was in Florida. This caused me some problems in communication. Language issues – if I had been better with French or more willing to try, I might have saved two weeks. The amount of paperwork required would have been difficult with my limited French. FedEx – The FedEx office in Saint Lucia went beyond the call of duty to aid me. I was disappointed that FedEx in the US was so expensive. But, I can understand their need to subsidize the rates. I might have avoided some headaches by using them even at the high cost and saved a couple of weeks. I don’t know if the insurance company would have covered the extra cost, I did not ask. Saint Brendon’s Isle – I can’t say enough about how good they are. Took care of me. They might have helped with the Lithium Ion battery issue if I had known to ask before shipping the camera on to Four Star Cargo. Canon – In the end they did everything they said they would do. It was a lot slower than I hoped or initially understood. But, that may have been my not asking the right questions or not hearing the answers. Canon’s not being able to give me the answer on shipping LI batteries; I put down to not finding the right department. Canon is a major corporation. Lots of inertia and corporate BS. I will join their professional photographers program. B & H Photography – Excellent people and prices. Why I was unable to get an answer on my question about the LI batteries I am not sure. They included an extra battery (the problem with shipping), a memory card, a camera case and a monopod for free. None of the free items were junk, but quality stuff that I might have bought. The issue of referring me to Canon for repair was well documented in the web site and they were honest about the options. Four Star Cargo – By the time my camera reached them I was highly frustrated. They dealt with me in a polite helpful manner. Their call on the batteries was correct. Sea shipment worked and I got my camera. The cost of the shipment was 1/6 of that by FedEx. OBTW – when filling out the form on-line, use the address you want the package sent to not your mailing address. This was my rooky error. Once the wrong address was entered they needed to delete my account so I could start over. The second shipment took only a moment to set up and all worked well. Except it arrived in a week where there were 3 holiday days. So the line to pick up packages was out the door and around the building. Customs in the Eastern Caribbean – This is the root of the problem and the cause of my major headaches. All islands, that I am aware of in the Eastern Caribbean, have duty on importing cameras with the exception of Saint Martin. The duty varies from 10 or 15% to more than 50%. In most islands, you can get an exemption from the duty for a camera being sent in for repair. But, you need to fill out a form and have the serial number and particulars verified by a customs officer. This means if the camera you get back is different as was in my first case, you are subject to full duty. Also, this prevents you from shipping from one place and receiving it at another. Shippers and Shipping Agents – most islands have many different shippers and a multitude of shipping agents. Four Star Cargo ships to most of the islands in the Caribbean. I spoke to a friend who is in the shipping business and works with agents all the time. Their advise, be vague about the description and lie about the price. This would get you a cheaper duty, if you are not caught, but would be a problem if the camera was lost or stolen in shipment. Most insurance policies do not cover the camera while it is in transit. My recommendations are either fly back to the US or depend on the kindness of others or go to Saint Martin. What happened to my old camera? I can only guess. Six months after I got the camera I was getting off the dingy at a floating dock. I had been taking pictures from the dingy and did not think to put the camera back into its water proof bag. I put the camera on the dock and then got out separately. 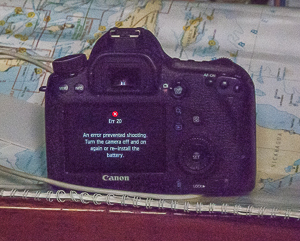 The dock sank and the bottom of the camera got wet (fresh water – I suspect salt water would have been fatal). At the time, there was no indication that there was any damage and the camera is well sealed. It continued to work for 2 and ½ years (some 20,000 pictures) before failing. Likely a drop or two of water got into the camera and in the end attacked the shutter or the electronics. One of the few times I failed to keep it in its dry bag. Get a dry bag or pelican case if you don’t already have one and use it. Every time. No exceptions. Expect 4 weeks minimum to get a camera serviced. With Murphy, it might take a bit longer. Keep a written and photographic record of the camera serial number. My insurance company asked for this right away. It was also needed to fill out the paperwork at customs for the FedEx people. Be aware that Saint Martin (both the Dutch and French side) is one of the few islands outside of the US islands that does not charge duty on cameras that I am aware of. All the islands will charge duty on the cost of repairs or the cost of a new camera if that is what happens. 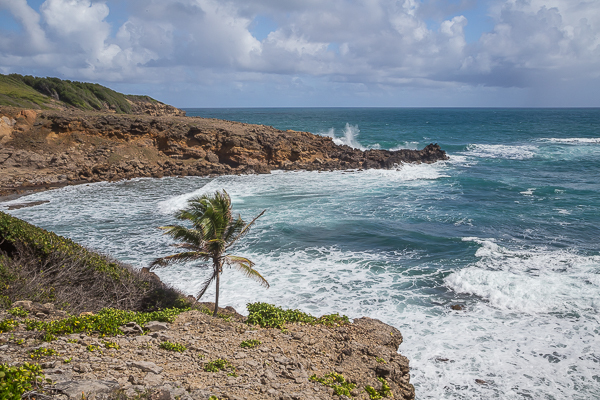 Where to get the new camera – I could have bought the new camera in Saint Martin. They have good camera shops and the prices are good. I decided to get it in the US because there have been a number of cases of “Gray” market cameras getting sold as new US. I had read a few of these cases in the camera press while my repair was going on. None was sold in Saint Martin. Some of these cameras were stolen camera where the external serial number sticker had been removed and a new phony number replaced. The issue was only discovered when the camera was sent in for service and the internal serial number was checked. As the camera was stolen, you get nothing back and have to take the issue up with the store that sold you the camera. Decided not to risk it. Hopefully, I will not have to go through this again anytime soon. Now I can get back to taking some pictures and sailing. This entry was posted in Photography, Single Handed Sailing and tagged Camera Repair, Photography, Sailing on June 10, 2016 by WildMWP.